–African-American unemployment hit a record low of 5.9 percent in May 2018. --Hispanic unemployment at 4.5 percent. –NFIB’s small business optimism index broke a 35 year-old record in August. --SurveyMonkey/CNBC’s small business confidence survey for Q3 of 2018 matched its all-time high. –Provided more than $5.5 trillion in gross tax cuts, nearly 60 percent of which will go to families. --Increased the exemption for the death tax to help save Family Farms & Small Business. –ICE’s Homeland Security Investigations division arrested 796 MS-13 members and associates in FY 2017, an 83 percent increase from the prior year. --Justice worked with partners in Central America to secure criminal charges against more than 4,000 MS-13 members. –ICE HSI seized more than 980,000 pounds of narcotics in FY 2017, including 2,370 pounds of fentanyl and 6,967 pounds of heroin. --ICE HSI dedicated nearly 630,000 investigative hours towards halting the illegal import of fentanyl. –Over 76,000 with dangerous drug offenses. --More than 48,000 with assault offenses. –Agreed to work with the European Union towards zero tariffs, zero non-tariff barriers, and zero subsides. --Deal with the European Union to increase U.S. energy exports to Europe. –25 percent tariff on $50 billion of goods imported from China and later imposed an additional 10% tariff on $200 billion of Chinese goods. --Conducted an investigation into Chinese forced technology transfers, unfair licensing practices, and intellectual property theft. –Recent deal with Mexico included new improvements enabling food and agriculture to trade more fairly. --Recent agreement with the E.U. will reduce barriers and increase trade of American soybeans to Europe. –Treasury has issued sanctions targeting Iranian activities and entities, including the Islamic Revolutionary Guard Corps-Qods Force. --Since enacting sanctions, Iran’s crude exports have fallen off, the value of Iran’s currency has plummeted, and international companies have pulled out of the country. –The two leaders have exchanged letters and high-level officials from both sides have met resulting in tremendous progress. --North Korea has halted nuclear and missile tests. –Rolled out sanctions targeting individuals and entities tied to Syria’s chemical weapons program. --Directed strikes in April 2017 against a Syrian airfield used in a chemical weapons attack on innocent civilians. –ISIS has lost virtually all of its territory, more than half of which has been lost under Trump. --ISIS’ self-proclaimed capital city, Raqqah, was liberated in October 2017. –Expelled dozens of Russian intelligence officers from the United States and ordered the closure of the Russian consulate in Seattle, WA. --Banned the use of Kaspersky Labs software on government computers, due to the company’s ties to Russian intelligence. –In 2017 alone, there was an increase of more than 4.8 percent in defense spending amongst NATO allies. --Every member state has increased defense spending. –Consolidated and strengthened VA community care programs. --Funding for the Veterans Choice program. But Saudi Arabia can kill journalists because they are buying our stuff. Okey dokey. Oh, and they are good people because Jared, the shining peace-keeping son-in-law is making a few bucks too. Something is wrong with @Jonahdog brain. Do any of these “accomplishments” reduce the size or scope of government? Are any of them authorized by the Constitution? Why, then, are they considered to be accomplishments? If the Trump Administration is such a success story, why did the Republicans lose the popular vote and a record 40 seats in the House as a result of the 2018 Interims - hardly the response one would have expeccted from a grateful nation if they believed "CatholicCrusader's list to be anything but "fake news!" This is what "democracy" and defending the CONSTITUTION looks like - even though the Democrats actually lost seats in the Senate, they won the popular vote by almost 13 million ballots, the House vote by 4.2 million ballots and the Governors' races by 800 000 ballots! This is the American voters' response to "Catholic Crusader's "laundry list" of Trump's achievements over his first 2 years! In the 21stC, American voters are no longer prepared to accept that going to the voting booth can be an exercise in futility, allowing the "deep state" to exercise the power as to whether their vote counts. The 2018 Interim Election was primarily a referendum on this President's first 2 years in office and the results speaks volumes as to the credibility of "CathollicCrusader's" laundry list of Trump "achievements!" Last edited by jgarden; February 2nd, 2019 at 08:13 PM. I really enjoy posts which are copy pasted. It shows a lot of effort on the part of the poster. I never said they should be. 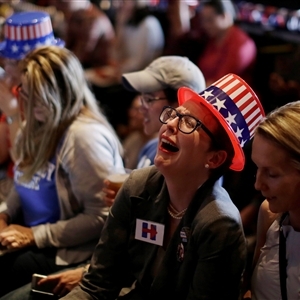 But when they lose fair & square, they should also not be a bunch of crying whining snivelers who try to overthrow the elected president based on fake charges and political witch hunts. If you cannot stand losing then stay at home. The system worked. A few extremists in a couple of mega-populated cities did not dictate to the nation. Last edited by CatholicCrusader; February 2nd, 2019 at 08:05 PM. The 2029 Interim Election was primarily a referendum on this President's first 2 years in office and the results speaks volumes as to the credibility of "CathollicCrusader's" laundry list of Trump "achievements!"